Hailing from two different regions, and approaching music from two different perspectives, emcee Luck-One and producer Dekk came together seamlessly to put forth what will be the debut for them both on the short length album entitled Beautiful Music, a non-profit offering set to raise awareness about the plight of those in Haiti, the western hemisphere’s poorest nation. Introduced through a mutual acquaintance in late summer of ’08, just weeks after Luck was released from serving over half a decade in Oregon prisons, Luck and Dekk, a University of Oregon graduate who holds a Bachelor’s degree in sociology, began their relationship discussing hip-hop and the direction it was to take in the new millenium. Soon, Luck was making bi-weekly Greyhound trips down to Dekk’s in home studio in Salem, and those discussions would slowly become the foundation of their stellar debut, completed less than five months from their first conversation. Beautiful music is daring, yet cohesive. 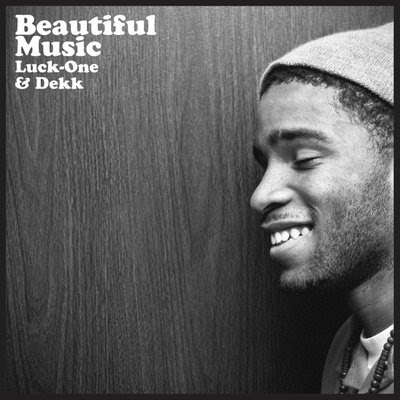 Awe inspiring in it’s ability to push the envelope with Dekk’s often eclectic production, while at the same time remaining undeniably hip-hop thorught Luck-One’s true school lyricism. Luck’s gripping rhyme schemes are flawlessly interwoven with Dekk’s irrefutably next-level soundscapes, drenched in his signature synth-heavy sound, and backed by the sparse drum patterns that add to the tracks without taking away from the urgent messages that frame them.